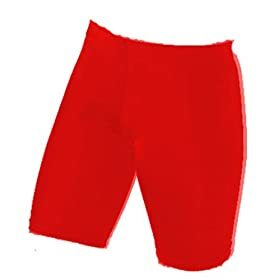 Women's Padded Classic Bike Shorts Cycling Bicycle Biking : The ideal short for the cyclist who wants excellent comfort during the bicycle ride. Premium quality, four-way stretch tricot fabric moves with the cycling motion. This short has a smooth, two panel construction. No Leg grippers for extra leg comfort. Shorts stay in place without grippers because shorts are make from highest quality fabrics. The smooth, seamless pad reduces opportunity for abrasion and saddle sores. Bike Shorts add comfort on longer bike rides because the compression the spandex against your muscles supports your hard work on the bike. Cross Grain Cutting maximizes stretch performance of spandex fabric. Fabric is four way, 7 1/2 oz, nylon/lycra, tricot knit - THE BEST! You want Comfort on the bicycle.